In an extra-sad twist, Amy Winehouse apparently tried to contact Dr. Drew just days before she died. "I found out yesterday that, believe it or not, she was trying to contact me — which was weird," explained Dr. Drew. What advice would Dr. Drew have given Amy if he reached her in time? "Go away and stay away for a long time. Don't even think about your career. That doesn't matter. It's all about saving your life." Winehouse's parents said they believe their daughter may have died from alcohol withdrawal, but Dr. Drew told "Extra" that probably wasn't the case. "You can die from alcohol withdrawal... I doubt that is what happened. When alcohol withdrawal itself is fatal, it's a progressive, severe illness... it's not like they drop dead." "There are Amy's T-shirts. This is what she would have wanted – for her fans to have her clothes," Mitch told the crowd. 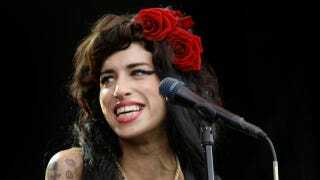 As he handed out the items, a pair of Amy's signature ballet shoes were visible in his back pocket, reports MTV.com. "God bless Amy Winehouse," Mitch added before riding away in a taxi. True Blood creator Alan Ball has inked a deal for a fifth season of the hit show, saying he wants to leave the show eventually, but that day won't be coming any time soon. "There will be an end for me at some point but I just closed a deal to do another season," he said. "I don't have any desire to leave because I'm having more fun than I ever had in my life." The ever-busy Ball told The Hollywood Reporter that this deal is exclusive to HBO, as he also has a "couple pilots" in development with other networks, and has signed on to direct a dark comedy he developed with Elan Mastai with Paramount Pictures. So basically, assuming that Ball might actually be some kind of superhuman is a pretty safe bet.